This is a basic home owners push mower that should serve you well for a small to medium size yard. 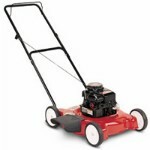 It features a 21 inch cut, 4hp Briggs and Stratton engine and offers mulching or rear bagging options. It lacks some of the higher end features like self propulsion but is very economical, usually available for under $200. I find that the mulching works quite well when the blade is sharp and is probably the best way to use this mower. If you start to notice it leaving lines of larger clippings it may be an indication that it is time to get your blade sharpened or replaced. The one weaker area on this mower is the rear bagging option. The bag capacity is not very large, and the the way it tries to fill the bag from the bottom of one end usually makes it stop accepting grass at about half full. If you are cutting taller grass, or a larger yard you may find yourself emptying the bag more often than you like. Removing and emptying the bag is not difficult, but is not very convenient either and you often have to shake the bag a lot to get it to dump. The Briggs and Stratton engine is a reliable workhorse that last for many years and often starts on the first pull if you take care of it. Like all mower engines, make sure you drain the gas at the end of the season, use good fresh gas to start the season, change the oil and keep the air filter clean. Bought mine from a neighbor who was moving for $40. It has run well with no problems. If grass is thick you will have to empty bag often. Perfect for a small lawn which we have. Bought from private owner. Had been sitting his storage for over a year. Filled with gas and a couple of hundred pulls later, ran like a champ. 3 years later, and no servicing, it still runs well. Shame on me! I am, today, giving a full service. I bought my first one at a neighbor's auction. I got it for $35, it was clean and running well. My girl friend need a mower, so i gave it to her. That was 4 years ago, and she has used it steadily. was sitting in her yard - missing carb / governor springs. I assumed I could easily buy parts. i'm still waiting for one spring to come. I find a Youtube video showing troubleshooting. I'm praying for a better spring. at least the ancient push mower works. no gas engine, but it' exercise. underpowered, cheaply built parts, carburator design very poor, handle angle nor adjustable and at a very bad angle. Join in and write your own page! It's easy to do. How? Simply click here to return to Yard Machine Lawn Mower Consumer Reviews.